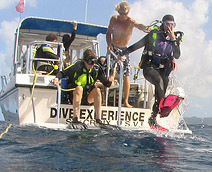 All dives include equipment, transportation to the dive site, and an instructor or divemaster guide. 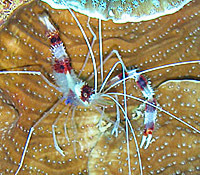 Morning two-tank dives consist of a scenic wall dive, followed by exploring beautiful coral gardens ( two separate locations). Please book by 3pm the previous day to ensure your space on our boat! The boat leaves at approximately 9:OO a.m.* and returns between 12:00 and 1:00 p.m. Dive sites are chosen according to conditions; also, special requests are welcome! Includes gear, instructor/guide and a tank-full of fun! Now offering afternoon Lionfish hunts. One tank dive includes spears. Check with the office for details! Group Rates: When 8 divers purchase of 10 tank dive package, the 9th dives for free! 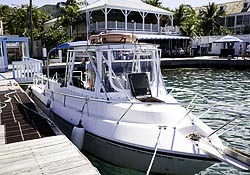 Dive Packages are priced per person. In order to staff our dive tours and classes we rely on our advance bookings. Our cancellation policy is full refund if the cancellation is 24 hours prior to the day of diving or if we cancel for bad weather or other unforeseen problems. No show and less than 24 hour notice, we will not refund the cost of the dives. We want our customers to have the best time while on vacation. If you are prone to sea sickness we recommend the night before to take one tablet and the next morning the normal dosage of seasick meds. They do not seem to work the morning of…just a hint.